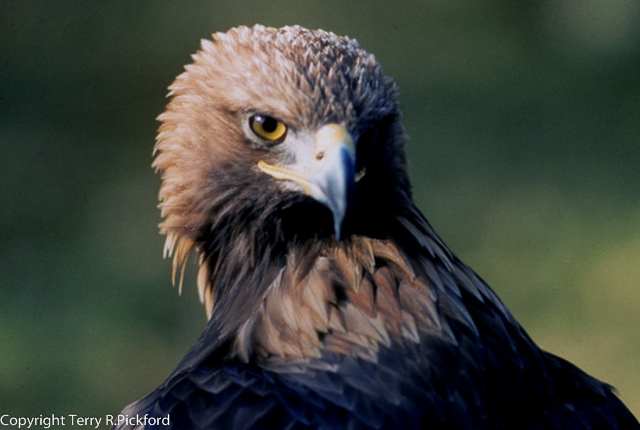 Fred’s suspicious disappearance brings about problems for the South of Scotland Golden Eagle Project. The suspected killing of Fred the young Golden Eagle could not have come at a worse time. This is because the South of Scotland Golden Eagle Project is about to attempt to re-establish Golden Eagles back into the Borders and Dumfries and Galloway. Not only did Fred hatch at an eyrie in the Borders [son of Roxy hatched in Dumfries and Galloway], but Fred’s disappearance casts doubt on the legal aspect of such a scheme. According to CITES this project must demonstrate that Golden Eagles can not establish on their own by moving naturally into the project area. This has been sidestepped by suggesting the killing of eagles is taking place outside the project area, and that all landowners are in favour of such a reintroduction. Sadly, with Fred’s disappearance this has now shown not to be the case.As for Scotland’s landowners – how many consulted their gamekeepers asking for their view on such proposals? Most gamekeepers wages are bolstered by a non taxed cash handout given at the end of each shooting season by satisfied members of the shoot, these bonuses are often several thousands of pounds. Disrupted shoots caused by birds of prey can knock £1000’s off a keepers annual tax free handout, so why would the regions gamekeepers want Golden Eagles flying over their moors causing not only disturbance to a days grouse shooting, but also to upland Pheasant and Red legged Partridge shoots? 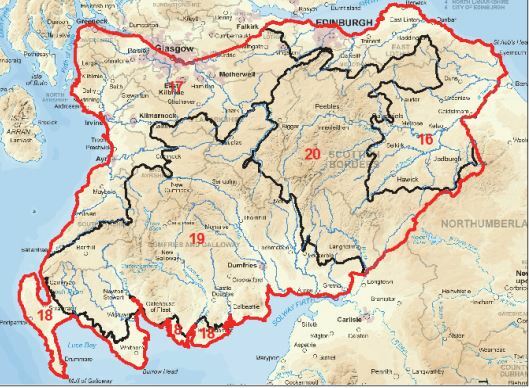 Southern Scotland Study Extent (red boundary) and Natural Heritage Zones (black line: Eastern Lowlands (16); West Central Belt (17); Wigtown Machairs and Outer Solway Coast (18); Western Southern Uplands and Inner Solway (19); Border Hills (20)). The new committee set up by the SNH to look into the running of Red Grouse moors has been told to look into how gamekeepers are paid, claiming methods being used are regarded as the biggest problem resulting in wide scale persecution of Bird of Prey on Red Grouse moors. They know that the total cash flow to keepers throughout Scotland runs to £millions of untaxed handouts in good Red Grouse shooting years. The history section from pages 11 to 17 of the report never mention Kielder as such, and certainly didn’t give any details of how important these breeding birds were to the Border area! The last young fledged from Kielder in 2001 [Foot and Mouth year] resulted from the absence of disturbance to the nesting birds during this period. The young female flew south only to be killed around Alston in Cumbria. This Kielder pair was finally destroyed first by losing its male to a Crow Trap, and the female then moved to Peebles where she nested for only 1 year before she was also killed. The question which should be answered before progressing with the reintroduction, is where will any of these young eagles be safe? One very good area not mentioned in this report was Langholm Moor itself – Why? This location at Langholm would be ideal for eagles allowing them to move west into Galloway, east into the Borders and north towards Moffat. It is also well away from the present breeding pair which includes the female Roxy. There is also the chance of some birds moving to colonise Northern England especially the Lake District again with few, if any, keepers on any of its uplands. The staff for the eagle project you would think would prefer Langholm for the release of eagles, as the chairman of the south of Scotland project was the former agent for the estate now living close to Langholm. The eagle project leader lives in Langholm itself, and her partner has been taken on as the main field officer. The assistant field officer for the project was also the assistant for the old Langholm 10 years scheme which finished in August 2017. The big question is should the scheme go ahead if Langholm is not used? Certainly due to £1.5 million allocated few will try and stop the scheme progressing even if young Scottish Golden Eagles are to be put into the firing range. Keep checking this web site to find the most up to date information regarding this project. 4 comments to Fred’s suspicious disappearance brings about problems for the South of Scotland Golden Eagle Project. This is a very interesting article but I have to say with respect it does not appear to be anything but a plug for Langholm. Of course Raptors can expand their range naturally. Look at the natural spread of White-tailed Eagles and Red Kites territories far from initial core release sites. Just because none have returned to Langholm Moor does not mean they won’t or can’t. Perhaps Kielder never featured in the “Golden Eagles in the south of Scotland 2014,” report for the very simple reason that it is in England? I am sorry but I fail to see any point to the article at all interesting though it may be. Thank you for your comment but you should know the Kielder Golden Eagle nest when occupied was located in Scotland. No I did not know that and perhaps the compilers of the South of Scotland report did not know it either? Yes Wayne,somebody has missed a trick there. If the team behind the tagging had just made an effort, even if they had failed, people would have understood and it would have made a good story. As it is, unless there is something we don’t know, it’s just another bird disappeared,nothing proven.